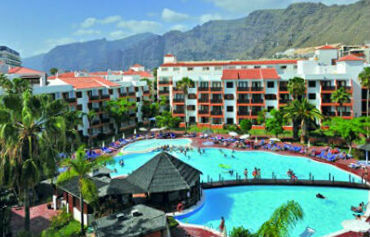 For relaxation in the Tenerife sunshine, you can't miss the Tamaimo Apartments in Puerto Santiago. This great value complex is set on a steep hillside and offers breathtaking views to the Los Gigantes cliffs. Onsite the list of facilities is impressive, with something to suit all the family. The sunny pool area takes centre stage during the daytime. The trio of pools are lined with spacious sunbed filled terraces, perfect for laidback days topping up your tan. The children have a pair of pintsized pools to splash around in. There is an adultsonly sun terrace on the roof if you want to get away from it all. Away from the water, there is lots to keep activity fans occupied discover everything from tennis and football to table tennis and mini golf. The fun filled kids club is packed with activities and games to keep the little ones happy. The apartments themselves are spacious and modern. Each comes with cooking facilities to rustle up a snack or two. Your own private terrace is the ideal spot to relax with a drink and admire the views. On the food and drink front, you'll uncover lots to tempt your tastebuds. The main restaurant serves up tasty dishes three times daily and regular themed evenings each week. The pool bar offers up a host of freshly cooked BBQ treats each afternoon. There are pizza and pasta specialities on the menu each evening in the Italian gourmet restaurant. The line up of evening entertainment includes live music, cabaret shows, fun and games in the disco bar. Discover why the Tamaimo Tropical Apartments are a popular place to stay for holidays in Tenerife. 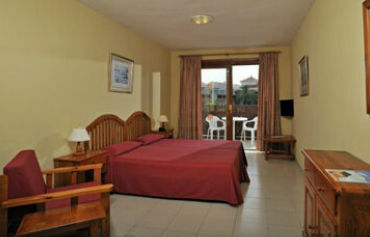 The Tamaimo Tropical Apartments has all the facilities you would expect from great value Tenerife apartments. Highlights include: Three outdoor swimming pools with sun terraces and parasols, two kids pool, buffet restaurant, Italian restaurant, two pool bars, snack barbarbeque, disco bar, animation programme, internet connection, WiFi zone, Jacuzzi, TV, kids club, massages, bicycles for hire, table tennis, billiards, mini golf, darts, tennis, football and hair salon. The 24 hour reception offers car hire, currency exchange, courtesy room, laundry service and doctor on the premises. The complex has a total of 372 modern guest apartments, consisting of 46 studios, 286 one bedroom apartments and 40 two bedroom apartments. All apartments feature a fully equipped kitchen with ceramic hob, coffee machine and kettle, complete bathroom, air conditioning, satellite TV, terrace, WiFi, handicap accessible, nonsmoking rooms, extra bed available and safety deposit box to rent. 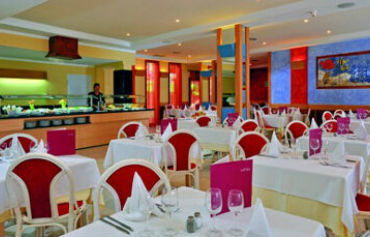 The main restaurant serves buffet style meals with regular theme nights. The Morrocoyo Italian Restaurant specialises in pizzas, pasta and salads. There are also two poolside bars for all your beverage needs. The snack barbarbeque serves a tasty menu of hot dogs, hamburgers, pizza and chips. The disco bar hosts the evening entertainment including live music and professional shows. The all inclusive package at these apartments in Tenerife includes: Buffet style breakfast, lunch and dinner, snacks, beverages with meals (wine, water, refreshments and beer), soft drinks, local alcoholic drinks and dining in the Morrocco Italian Restaurant. 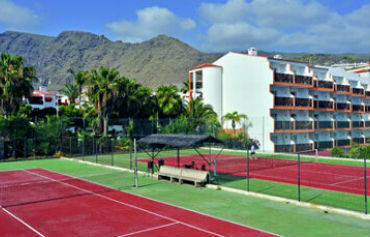 The Tamaimo Tropical Apartments are located in Puerto Santiago, between Los Gigantes and Playa de la Arena. Reina Sofia Airport is approximately 45kms away.